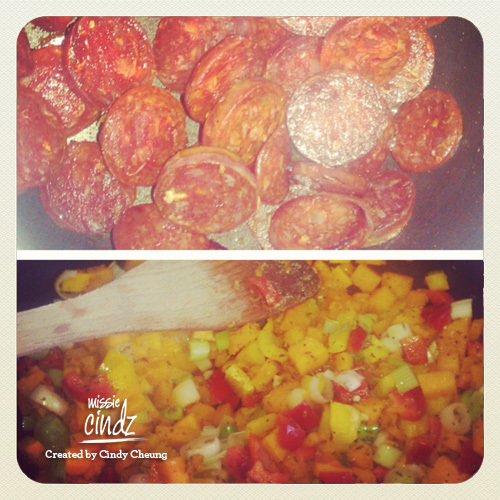 Step 2: Peel & dice the veg into into small cubes & slice the chorizo into coins. Add all ingredients to a large pan over a medium/high flame. These easy-to-make wraps are delicious, versatile, portable and filling! Recipe provided by Kevin Munns. There are many variations of this dish cooked in my household – it is a family favourite, easy to cook and pretty cheap. Cost is one thing we are all concerned with in times like these and feeding a family of four decent food at a cheap price can often be tricky. I like to buy quality produce whenever I can but most of the time I end up in Tesco or Aldi looking for reasonably priced items that are tasty and not too time consuming to prepare. Chorizo is available fresh, dried or semi-dried from Spanish shops, delicatessens and good supermarkets. The chorizo I’ve used is a reasonably priced Sainsbury’s offering – it’s good and does the stuff, costs less than £2 (and you only use half of it). If you don’t mind spending £6 then Waitrose’s Iberico chorizo is amazing! This whole recipe meal costs around £7 for 4 people – and to me, that’s pretty decent! These chorizo and butternut squash wraps are full of flavour and contains one of my favourite cooking spices – cumin, it has a great affinity with squash and also complements well with the chorizo – something that is really tasty and used pretty regularly up here in Banner Cross (Sheffield)! Give it a go and let us know what you think. Note: often recipes using chorizo doesn’t need additional oil to be added to the pan since it provides its own. The fat can then be used to cook the remaining ingredients. Peel & dice the onion into into small cubes & slice the chorizo into coins. Add the chorizo to a large pan/wok and cook over a medium/high flame, turning a few times until looking crispy and brown. Set aside retaining a tablespoon of leftover oil/grease in the pan. 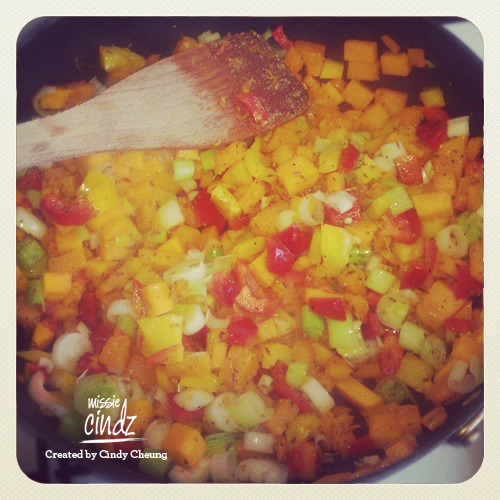 Add the squash to the pan with some salt/pepper & the cumin. Fry, stirring occasionally until semi softened. Add the remaining ingredients, saute until tender, about 5-7 minutes. You’ll have to make a call on whether you will need to add extra oil to the pan to make sure the mixture doesn’t stick to the pan. Taste for seasoning. Meanwhile, make the sauce. Add the chopped tomatoes/passata to a saucepan and add the cooked chorizo (from step 1). Cover and simmer over a gentle heat for 5-10 minutes, until the sauce is thickened. Season to taste (the flavours of the paprika from the sausage will permeate the tomatoes nicely). Place 2-3 tablespoons of the vegetable mixture in the middle of the totilla wrap, fold in either end and close the gap by folding over the other 2 sides. Place this in the oven dish, faced down. Repeat for the remaining three wraps. Generously pour the tasty chorizo tomato sauce over each wrap. Bake in preheated oven for 15-20 minutes. To serve. Place a mound of salad in the middle of a plate and position each wrap on the top (or at the side, whichever you prefer). Delicious! you could omit the chorizo by adding some feta cheese to the wraps, giving you a great vegetarian alternative. adding fennel seeds and ground coriander to the mix too for extra flavour works well. squeezing fresh lime juice and jalapenos to the top of the mixture before wrapping. 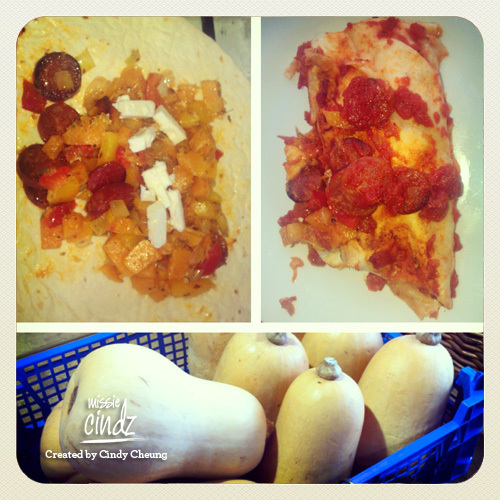 using the tomoto/chorizo mix as the base for a wholesome vegetable chilli – it is very tasty! Written and photos by Missie and Friends contributor Kevin Munns in Our Bake-In/Cook-In Stories.